Spring is in the air!! 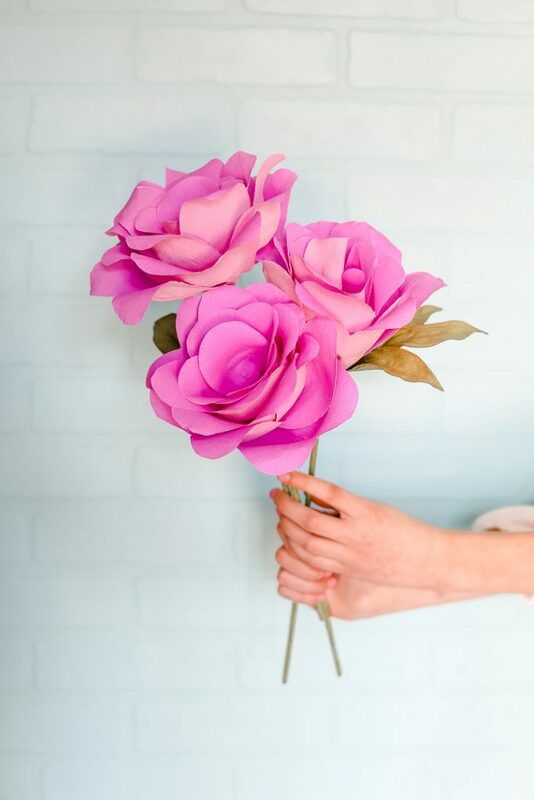 Flowers aren’t quite here yet, so we’ll just have to do what any crafter would do – make our own 😉 Here’s the deal – there are paper flower artists out there. I’m not one of them! I took a paper flower class and was discouraged because I couldn’t get it. 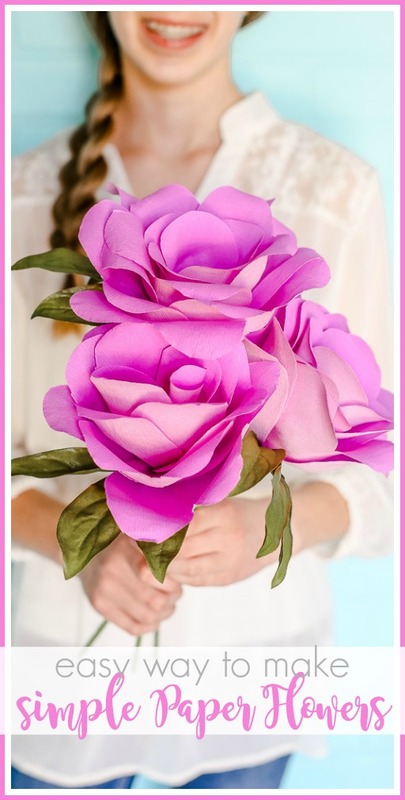 So today’s tutorial is for us everyday crafters, not the paper flower professionals. 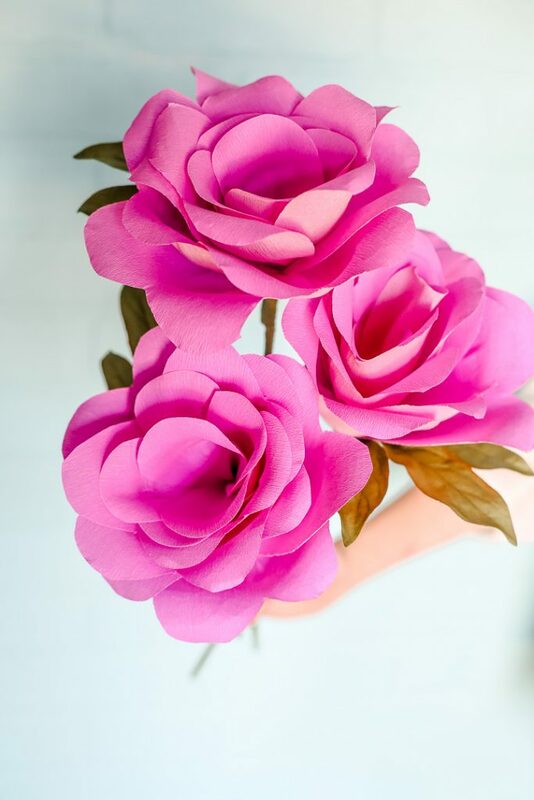 I’ve found what makes paper flowers FAST and EASY and so ANYONE can make them! 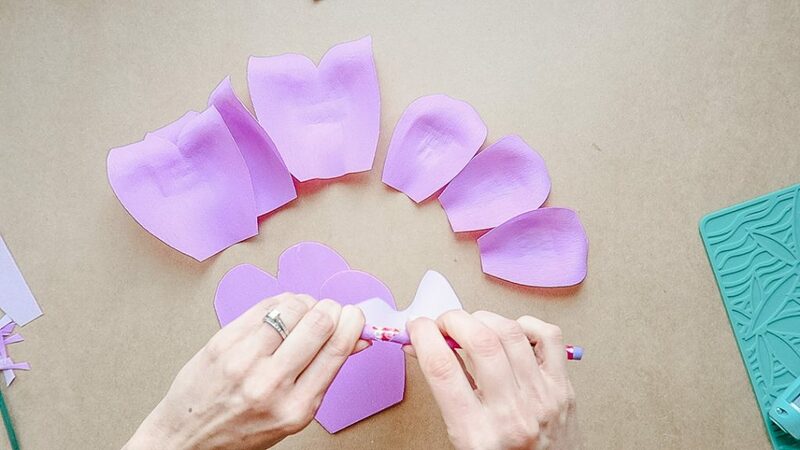 So let’s tackle these Simple Paper Flowers. These ones are meant to resemble roses – I thought they turned out pretty great. So pretty, right?! You can make them any size, but I love these ones, they’re a little bigger than the size of your hand. I can’t wait to try to make a super huge one! 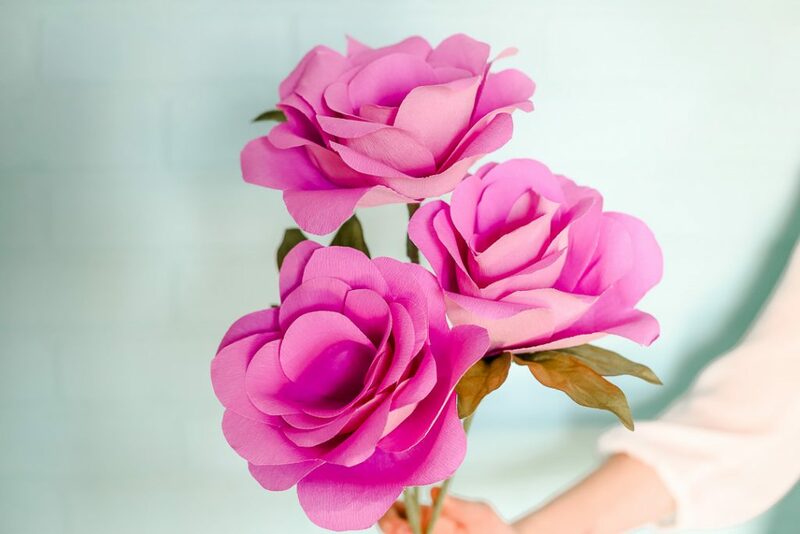 Part of what makes these so great is starting with the right material – using Crepe Paper makes it SO EASY. Seriously, it’s worth waiting while you order the crepe paper. It’s only about $2.50 and I was able to get 2 flowers out of one pack, so $1.25 a flower. There are lots of different color options, and I love that it’s Double-Sided Crepe Paper. I went with the Lilac but think it would be really pretty in a pink or a yellow as well. I used the prefolded sections of the crepe paper to cut the flower petals. Freehand a heart shape out of the large sections. Freehand a teardrop shape out of the small sections. Both shapes don’t need to have a point at the bottom – they should be more flat at the bottom. 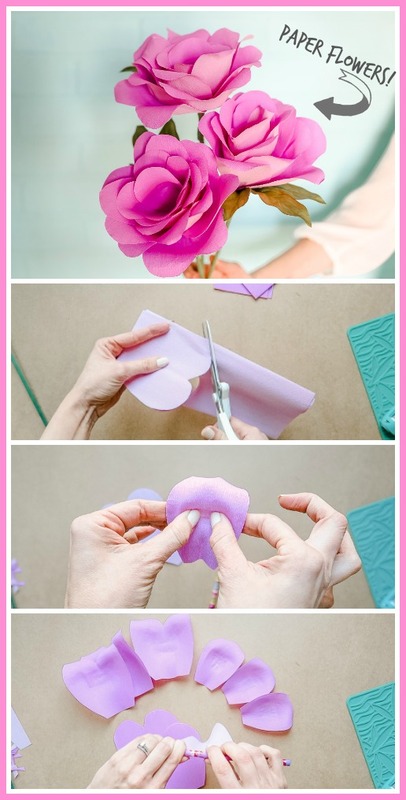 Wrap the top around a pencil – that will curve out the flower petal. Because you’re using crepe paper, it will hold it’s shape really easily. 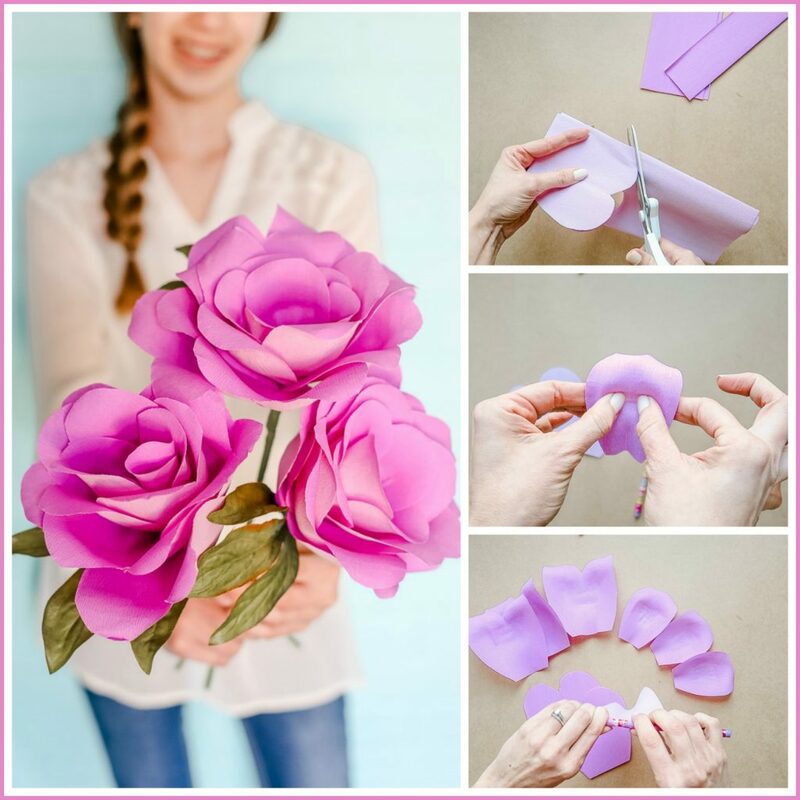 Then – with the magic of crepe paper – you can “pull” out the middle of the petal – this will make a bowl shape in the middle of your petal. Don’t stretch the top or sides, just the middle. 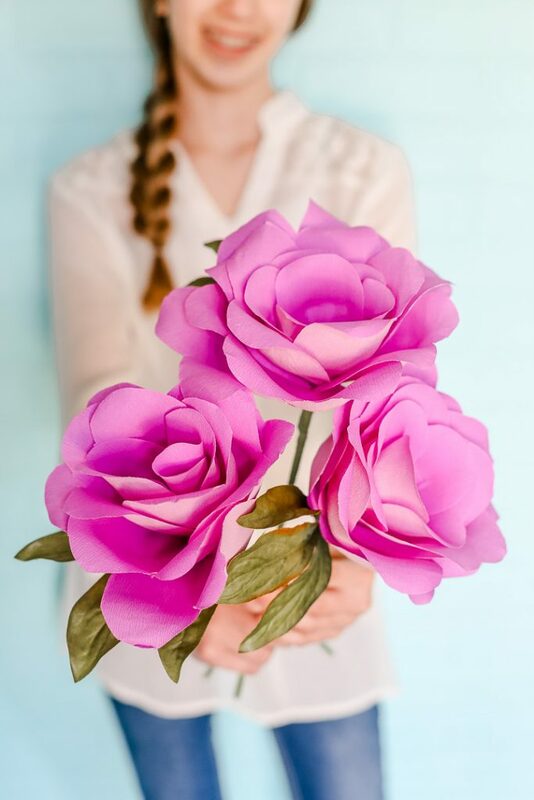 Do this to all the petals. Remember, we’re just crafters, not paper flower artists – we’re not aiming for perfection 😉 . Just do your best and quickly breeze through prepping all the petals.